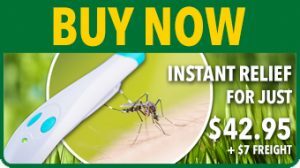 Insect bite and sting relief in Australia, Just $49.95 - our story of Bite Away. Instant relief from insect bites and stings including Mosquito bites. 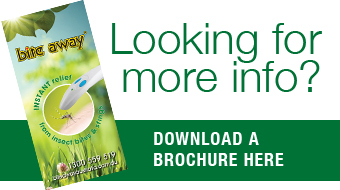 Our mission is to supply Australian’s a chemical free alternative that instantly relieves the pain and itch caused by insect bites and stings. Finally we found Bite Away® when we opened our home to a German exchange student for 6 months. Knowing how many insects we have in Australia, he brought with him a Bite Away® device. We still own that original Bite Away® device today. After seeing Bite Away®’s amazing results we pursued distribution rights for Bite Away® in Australia. Australia has amazing outdoors, and wildlife. We want you to be able to share our way of life with your friends, family, and children comfortably, without the irritation caused by insect bites and stings. Bite Away®is completely safe for everyone, including: children, people with pacemakers, or who suffer epilepsy, and pregnant women. It is ideal for those who have skin allergy reactions to bits and stings. Bite Away® is called an insect bite healer as the device stops the pain and itch of an insect bite. Additionally it helps the bite site heal. This means the swelling of your bites reduces and disappear much faster than if they were left untreated.